After the rebound in Kazekoshi’s score at the end of episode 17, both Kazekoshi and Tsuruga seem to have regained focus through thinking about their other half. :P hahahahaha Koromo has now turned her attention to Saki and as a result allowed the other two players to score some points. In the meantime, Saki is staying all quiet causing some distress to Koromo. hehehehe Turns out she’s not feeling quite right…the reason being??! She wants to take her shoes off!!!! hahahaha Ok – bizarre turn of events, I agree but what the heck! Let’s get on with the game!!! I just want Saki to WIIIIIN!!!! LOL after one tiny win that almost shocked everyone off their chair, we get her signature hand!!! kekeke But again, it is another really small win…what is going through her mind?! Finally in the 2nd last game, her playing seems a bit odd…her moves seem to be go against the idea of a large hand!! I have confidence in her…Kazekoshi girl has a big hand close to winning, even Koromo can sense it but she can’t seem to sense any danger from Saki! My friend screenshot how Saki came to build her hand, and it is IMPOSSIBLE to play like this unless she knows what tile is coming >4 tiles in advance. Haha! I love this episode! Saki IS COOL!! With the power of yuri Saki’s win is perfectly possible! i dont understand and never played mahjong before but i just love saki! yuri aside *ehem*, the showcase of gameplay is absolutely amazing!!! they make it so interesting that even someone who doesn’t understand it is totally hooked. LOL Sounds like I wasn’t the only one that was impressed!!! 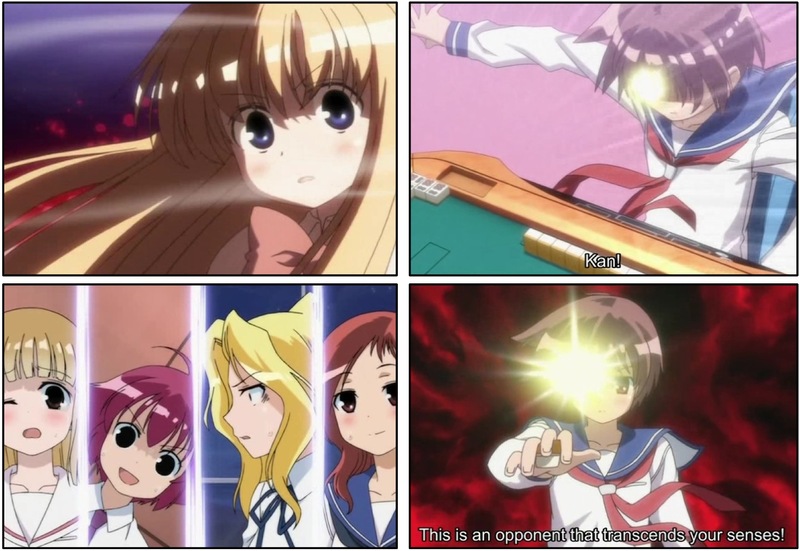 Saki has been surprisingly good seriously. The only thing I don’t understand is Nodoka’s chest…hahahaha More of SAKI!! Ah mahhh gawd. I need to re-watch everything/re-read everything. BTW, while it literally is a tsumo after a kan, the name in japanese “rinshan kaihou” basically means flowers blooming. Hence, all the flowers that appear whenever Saki pulls it off. « [anime] Yoku Wakaru Gendai Mahou Ep 4 ~ Misa & Yumiko are so cute together! !